Brig-Gen Roland Bradford VC and connected items at Shipley Art Gallery in Gateshead. Part of The Shipley Art Gallery's permanent collection includes various items connected with Roland Bradford. Will you allow us to extend our sincerest sympathy to you on your bereavement caused by the loss of your son, Brig.-General Bradford, V.C. The nation has reason to mourn his loss as deeply because the mere fact that he attained his high position at the age of 25 is significant of the value placed upon his services by a grateful King. 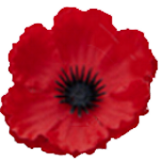 No one is better able to judge of his kindness of heart than his Mother, but a letter written us by your son, under date 8th November, of which we beg to enclose a typed copy, giving evidence as it does of his thoughtfulness to all the men under him, will we have no doubt be appreciated by you. With it we enclose a copy of the picture referred to in the letter and which we had the gratification of preparing for him, but with which we have not proceeded any further. This is a black and white version of the card of which Roland was ordering 3000 copies ... a signed copy for each of his men ... from the well-known card publishers, Raphael Tuck & Sons Limited, of Raphael House, Moorfields, in the City of London. Messrs Raphael Tuck & Sons Ltd. In reply to attached letter I think your Artist has succeeded in making an excellent picture. There is one alteration I wish. The Soldier should be wearing a Box Respirator in the "alert" position - that is in front of his chest. The enclosed sketch shows this. Perhaps your artist could get some soldier on leave (at Victoria) to show him the exact position. You will notice I have put a diamond on right sleeve. In my Battalion we wear a small green diamond patch on the arms. If this could be added I would like it to be done - although it is not important. I think the D.L.I. Crest would be better done plain than embossed in gold, as gold would make it look rather gaudy. I do not now wish the card to be a Christmas Card, but a Souvenir picture from me to my Lads. So there will now be simply the D.L.I. Crest, "Abide with me" and "With best wishes from Roland Bradford" to be shown. As it will probably be framed by many - then I would like the picture to be fairly large, as large if possible as the specimen. But this I leave entirely to you. Although I have suggested the position on the picture for the Crest, etc. to be printed, I wish your artist to use his own discretion absolutely, and if he thinks it would be better to change the positions let him do so. The other 350 please send to me at new address, sent in packages of about 200 each. Please complete and deliver as early as possible. I feel confident that you will spare no effort to turn out a fine picture. It is for a good cause. A view inside The Shipley Art Gallery, Gateshead, showing items connected with Roland Bradford. On the left is a brass D.L.I. Cross. Behind it on the wall just to the right is a drawing of a cross (shown below) which Roland had made and erected. The wording on the battlefield cross is:- "In memory of the gallant officers, NCOs and men of the 9th Battalion the Durham Light Infantry who fell in action SEPT 15th, 19th, & OCT 1st 1916. Erected in affectionate remembrance by their friends who fought with them and who will ever keep their memory green. 'Dulce et decorum est pro patria mori'. 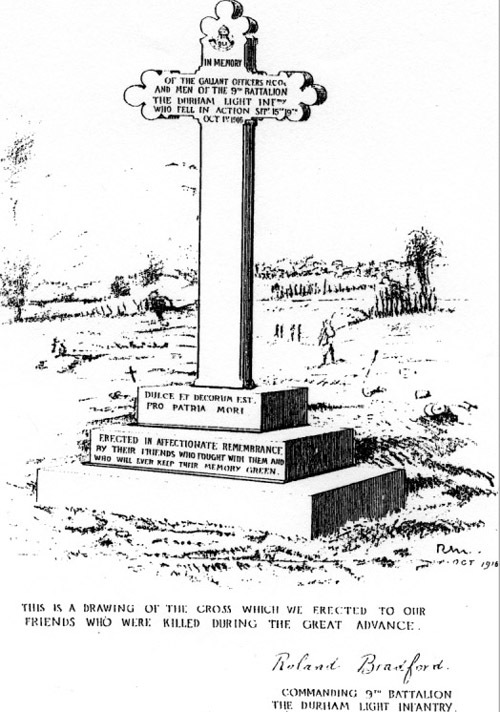 This is a drawing of the cross which we erected to our friends who were killed during the Great Advance." The drawing of the cross was by RM (Capt. Robert Mauchlen) and dated October 1916. The drawing of Roland's Battlefield Memorial Cross. At the D L I Museum in Durham can be seen the Battlefield Cross which was rescued, intact save for some signs of scorching, from the occasion when the Gatehead Church where it was located was set alight by vandals. 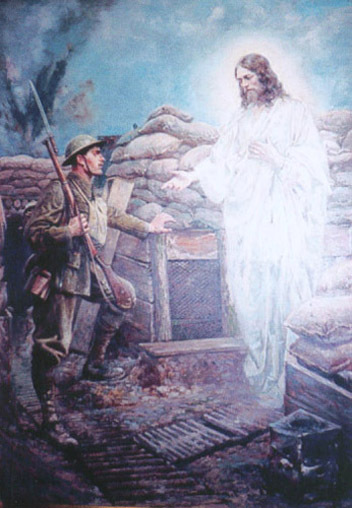 The painting 'Abide with me', which is part of the Shipley Art Gallery's permanent collection, is believed to be the second version painted by the artist Pio Ximenes. 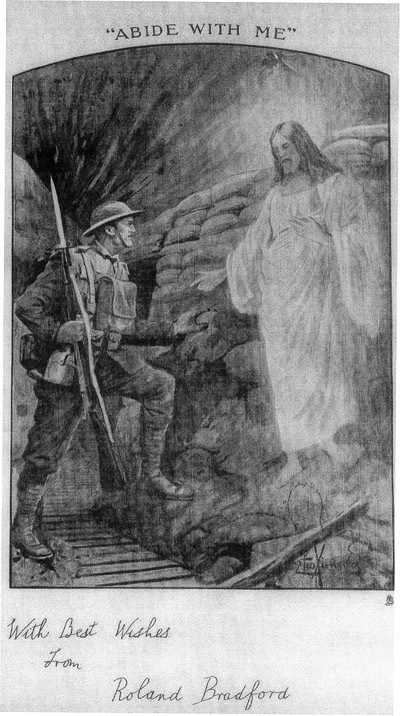 The subject matter and composition of 'Abide with me', which depicts a British soldier in the trenches of the First World War, witnessing a vision of Christ, originates with Brigadier General Roland Boys Bradford VC MC, who fought with the 9th Battalion of the Durham Light Infantry. Bradford corresponded with the publishers Raphael Tuck & Sons Ltd., requesting the production of a print illustrating his favourite hymn 'Abide with me'. His intention was to give each of his men a copy, as it had been the custom for the Battalion to sing the hymn before going into battle and at dusk each day. Following Bradford's instructions the artist Pio Ximenes, who worked for the publishers, produced the first version of the painting, in order that prints might be taken from it. Bradford outlined exactly what he wanted in the print, even how the soldier carried his gas mask. The only request he was denied was the inclusion of any badges or regalia, therefore instead of the man in the painting representing a particular soldier, he represents all British soldiers that fought in the Great War of 1914-1918. 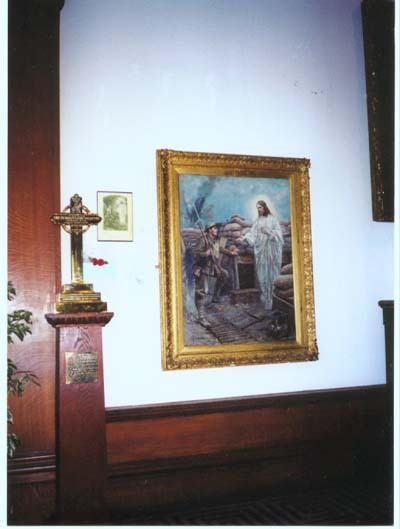 The composition of the print of the original version of 'Abide with me' and Pio Ximenes second version of the painting are very similar. The painting is not only a literal illustration of the hymn 'Abide with me', but certain elements within the composition can be seen as directly quoting specific lines. "Darkness deepens" and "Change and decay" can be seen "all around" the soldier except in the vision of Christ Himself. The artist has also deliberately used a diagonal composition as a device to illustrate the line from the hymn, "Shine through the gloom, and point me to the skies". The eye is forced across the painting, following a line from the darkness of the bottom left, up through the gaze of the soldier on to the illuminated face of Christ, then finally ending on the blue sky at the top right of the painting. This style of spiritual art was very popular during and straight after the First World War. There were many variations on this theme. Like 'Abide with me' they would have been reproduced as posters and postcards. The subject matter of divine intervention on the part of the allied soldiers appeals to people of all classes, at a time when religion was a great source of hope for many. Although a sombre piece, 'Abide with me' symbolised hope not only for the men at war but also for the people back home. On display next to the painting is one of the prints requested by Brigadier General Roland Boys Bradford. Roland Bradford gave this particular print to a Mrs Wallace from Gateshead, as a thank you for mending the uniforms of officers of the Durham Light Infantry, before they departed for France. Unfortunately little is known about the artist Pio Ximenes, other than he died in 1919 the year the second version of 'Abide with me' was painted. His name suggests that he may have been either Spanish or Italian in origin. It is also not known whether he produced both versions of 'Abide with me' at the beginning, middle or end of his career, as no other works by him are known. It is likely however that he would have been an established artist, because of his position at the publishers Raphael Tuck & Sons Ltd. In addition to this, we know that our version of the painting was a commissioned work. Thomas Reed, a solicitor from Gateshead commissioned the second version of 'Abide with me'. Reed was a collector of paintings and later donated this painting and others to local Art Galleries including South Shields Museum. Why Reed chose this subject is not known. He may have seen one of Roland Bradford's prints. He may have had some connection with the Durham Light Infantry, as many men from Gateshead fought with the DLI during the Great War. Therefore the painting may well have been commissioned as a source of comfort and hope. Painted in 1919 'Abide with me' is oil on canvas and measures 105.5 cm x 76.2 cm. A photo of The Shipley Art Gallery's painting 'Abide with me' by Pio Ximenes (1919).